At Musikmesse /ProLight+Sound 2004, Frankfurt, hall 4.1 E 51, K.M.E. unveils the internal digital delay module DDM as upgrade for its active systems CSA 400 D, QSA 500 D and QSA 200.. 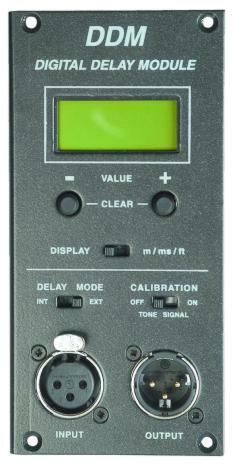 The delay module has two different operation modes (internal / external). In the internal mode transmits the required delay time to the internal active speaker, the external mode sends the delayed signal to another speaker system using a male XLR connector on the DDM panel, providing a control signal for external PA systems (e.g. CA 6). The internal line signal of the active speaker is not delayed. The module also provides an easy setup transmitting a test tone simultaneously to both systems. The back-lit display shows the distance in meters, milliseconds and feet for basic adjustment. Maximum delay is 1000 ms.